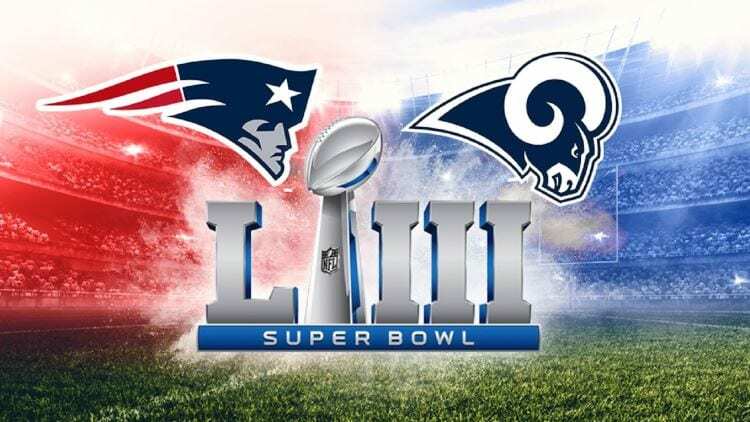 Super Bowl LIII sees the New England Patriots play in their third consecutive Super Bowl as they face the young LA Rams for only the sixth time in 16 years. The Patriots were winners of Super Bowl LI when providing a stunning come-from-behind upset of the Atlanta Falcons but they did lose to the Philadelphia Eagles to the “Philly Special” last season. Rams have been solid contenders all season and after narrowly escaping two playoff victories, the second-ranked offensive side will look to see off another high-powered offense in the Patriots. It promises to be one great Super Bowl and while some of the attention can head to what happens off the field, it should be all about the players this season. We have form from both teams, our best bets and our best exotic bets for Super Bowl LIII at the Mercedes-Benz Superdome in New Orleans on Monday, February 4. It wouldn’t really matter what form the New England Patriots brought into a Super Bowl as they would likely be the favourites regardless, but luckily for punters, they bring in terrific form. Led by the one and only Tom Brady, the Patriots shook off some late-season slumping form when losing consecutively to the Lions and Jaguars, with three strong wins and two of those came in the playoffs. They put up 41 points against the LA Chargers and although that score line finished 41-28, the game was in safe keeping at halftime. The Patriots were simply sublime at all levels in the Divisional Championship and that confidence rolled over to the Conference Championship game in Kansas. Facing the Chiefs at Arrowhead wasn’t going to be an easy task, even for a team which has a stack of Super Bowl experience like the Patriots, but they handled it beautifully. The Patriots held on to win 37-31 in a great show down between two exciting quarterbacks. Julian Edelman has shown why he’s still regarded as one of the toughest receivers in the NFL but the story of the Patriots success could stand with running back Sony Michel. Michel is a rookie which has rushed for 931 yards this season and although that’s not setting any records, especially compared to Todd Gurley’s 1251 yards, it’s when he chooses to make gains that count. If the occasion arises where Brady can’t find anyone open, and that’s likely against this Rams defense, then he uses Michel as his second option. It has been working beautifully and a main reason as to why the Patriots are in another Super Bowl. The Rams are riding a significant 10-game winning streak coming into the Super Bowl and they have won 13 of their last 14. After starting with some early jitters when losing to the Eagles and Bears in consecutive wins (Round 3 and 4), the Rams have got right back on track and their only loss since came to the Saints in a 45-35 shootout in New Orleans. Statistically, the Rams are the league’s second-best offense and that largely showed up against the weaker teams, but they combined for only 56 points in two playoff games and compared to the 78 put up by the Patriots, that’s a big difference. Of course, however, the Rams rely heavily on their defense which allows only 24 points per game and it kept the Saints to only 23 points at their own venue in the Conference Championship. Considering the Saints put up 45 earlier in the season, that’s some improvement and it came at the right time. There are questions about the Rams stability at the quarterback position and although Jarred Goff has statistically had a better season that Tom Brady, he throws some awful interceptions at exactly the wrong times. It’s often the Rams defense that makes up for his mistakes but those mistakes will be exemplified in the Super Bowl. Having Todd Gurley III (17 touchdowns and 1251 yards) at your disposal is another weapon the Rams should use heavily. He’s too dynamic not to use in the Super Bowl and they should try run down the Patriots throat all game. Take the pressure off Jared Goff and let Gurley III get the Rams into a manageable third down situation. Coach Sean McVay, the youngest in the league, is unique to say the least. He makes some hero calls but also makes some real head scratchers. Keeping a level head will be needed here. Backing against the Patriots in a Super Bowl? That hasn’t proven to be a smart move in most situations and we’re backing them to rebound after last year’s defeat. The Rams have plenty of positives going in their favour, but they don’t have a Tom Brady, Bill Belichick and numerous other players and coaches who have won the Super Bowl on multiple occasions. This is the first Super Bowl for many of the Rams players and that will count against them. We’re happy to see the bookmakers offering a line of –2.5 and it means we don’t have to take a half-point for those annoying 3.5 lines. We’re confident the Patriots will cover the spread for a little more value and we’ll again see Tom Brady slip another ring onto his finger. It should come as no surprise that Tom Brady is the $1.90 favourite to win the Super Bowl MVP and if we’re correct that the Patriots win the game, he’s a great chance of taking home another title. Even if the likes of Sony Michel, James White or Julian Edelman have massive games, it’s unlikely that Brady has an off game and he only needs to play half-decent to win the award. We have to find some value in this market, however, so have a stab at Cordarrelle Patterson at $201. Yeah, he’s unlikely to win, hence the odds, but he could be one of those “hero” type players who comes up with one or two amazing plays to change the change. The Super Bowl MVP can be decided on one massive play so he’s not the worst pick in the world. Sportsbet is offering six player prop bets and they’re all head-to-head markets. There can be good value to be made when betting these one-on-one markets. Below are our three best value bets. We have to go with Brady here, not because he’s throwing deep passes like Goff can do, but because he’ll be used more. Goff should use Todd Gurley III more often than Brady will use his running backs and that should see this h2h match up go in favour of the best quarterback to play the sport. Gronk has been a little shaky this season but wouldn’t it be like him to show up on the big stage? The enigmatic tight-end doesn’t often put up big numbers and hasn’t done much of that this season but Josh Reynolds isn’t anyone special and Gronk could eat him up numbers wise. “Minitron” or Julian Edelman to some, has been rock-solid throughout the season and we love his aggressive style of play. He’s a noted winner and although we respect Robert Woods, we can see Edelman getting his hands on the more way more often than his counterpart. If you’re looking for a bet on anything then Super Bowl novelty markets are for you. Punters can bet on anything from length of the national anthem, colour of the Gatorade poured on the winning coach and the first song played by the band during the halftime show. Below are our best novelty bets without analysis, because it’s almost impossible to provide explanation for these bets.